Parents are all too familiar with the warning signs. Your child comes home complaining of a cough. Your baby wakes up with his nose stuffed up, or your toddler tells you that he has a tummy ache. In those first few moments of a building illness, you envision the days to come: your entire family winds up on the couch or in bed, blowing their noses and running fevers, and you wind up so exhausted that making soup for your loved ones seems impossible. There are a few key ways to prepare for those pesky viruses that run through the entire family, and preparation will allow you to get through a terrible week in stride. Get started on chores. As soon as you see the first signs of illness spreading through your family, throw everyone’s laundry in the washing machine. Do every dish, and make a few reheatable meals. This will ensure that everyone has enough clean clothing and pajamas, and that you have easy access to healthy meals without needing to cook while you’re sick. Stock up. Scan your cabinets and your refrigerator and make a quick run to the store to make sure you have essential items. Pick up any groceries you know your family will run out of over the next week, make sure that you have cold medicine for adults, children, and infants, and buy tissues and any other household items that you know will make the family feel better. Plan your week. Is your little one going to miss soccer practice? Is there a bake sale you won’t be sharing your germs in support of? Think ahead to any non-essential activities you have lined up over the next week, and go ahead and cancel in order to lighten the loa d on your family right now. Consider the television. Some parents with children under two years of age do not let their little ones watch television, and many parents have a limit on the amount of television their kids can watch in a given day. These limits are normally well thought out and have a positive impact, but when you’re sick and your kids are sick, temporarily loosening up the TV rules can lend a bit of much-needed downtime on a miserable day. Take care of yourself. Yes, you’re responsible for a house full of runny noses, fevers, and coughs, but in order to guide the ship, you need to be feeling well yourself. Ask for help from your spouse or from family members so that you can do what you need to do for yourself, whether it’s taking a nap, a shower, or just taking some time for yourself. 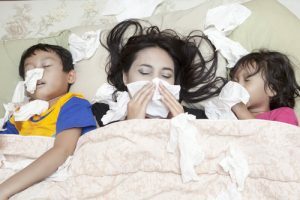 How have you survived the dreaded family-wide illness in the past? If you’ve got tips to make this inevitable event easier for others, please feel free to share them in the comments!